During the current interregnum at St Mary’s, Bishop Martin has asked Revd Bernard Sinton to act as Interim Rector during the vacancy. Bernard has worked in the Parish since 1990 and was our first SSM (Self Supporting Minister). He is based at Holy Trinity Church. Since retiring from a full time secular job, he has acted as Interim Minister during vacancies in Warnham, West Grinstead and Partridge Green and has just finished at Sullington and Thakeham with Warminghurst. Bernard’s wife is the vicar of Shipley. Have you any SPARE JAM JARS? … that you might donate for us to make some more preserves so that we can produce more ready for the Christmas period? Jars can be left at the back of church (in the cupboard in the bell tower) or at the Church Office. Horsham Matters has set up a “GoFund” page to raise money for a new van to be used to transport furniture to needy families within the Horsham District. Please go to www.gofundme.com/new-van-for-horsham-matters if you are able to donate. Thank you. 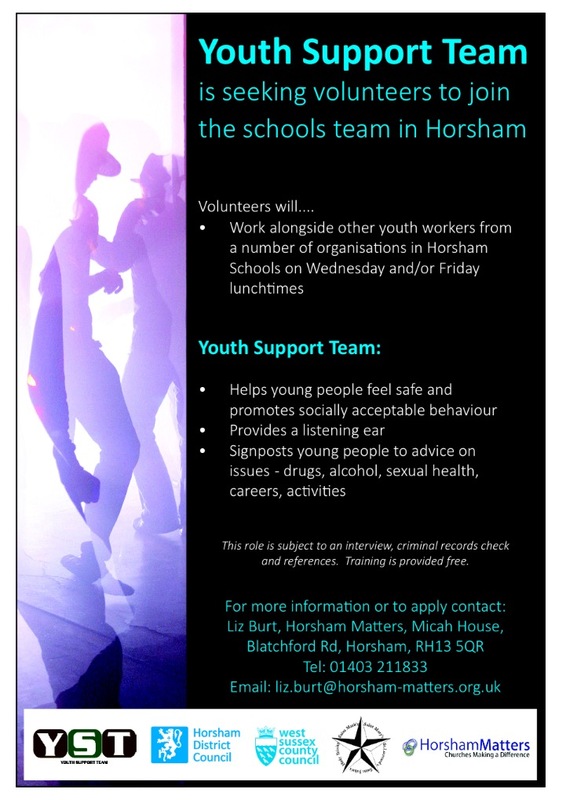 VOLUNTEERS NEEDED – TGIF is looking to recruit 2 volunteers to join the team to help run fun activities (baking/sports/craft etc) for young people aged 10-18. 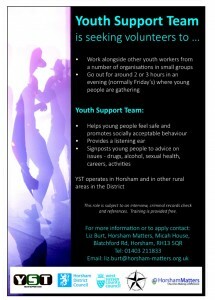 Great opportunity to share your life stories/hobbies with young people as well as teaching life skills. All volunteers are part of rota to fit their time commitments. Full training will be given. All applicants must complete compulsory DBS check & attend safeguarding training. Conservation – As you may be aware St. Mary’s needs to undertake major work to repair and conserve our fine building, especially our roof. This kind of work is very expensive to carry out and following discussions with our Church Architect we have decided to carry out the work in a series of phases. We have begun fund raising and are in the process of making applications to grant awarding bodies to help us on our way. We recently made a bid for funding to the ‘Listed Places of Worship Roof Repair Fund’ to carry out some urgent repair work to our Church roof, we await a decision. Even if we are successful we will still need to raise a significant amount of money, something in the region of £500,000, to carry out all that needs to be done. Renewal – Our plan is that one of the phases of work will also include improving our facilities inside the church. Thank you to all those people who completed the questionnaire earlier this year, looking at our current church facilities. We are now looking forward to our ‘Vision Day’, on Sunday 3rd July, when, as a congregation, we will explore how St. Mary’s Church can best prepare for our future ministry in Horsham. We must then look to discern how our church buildings and facilities can most suitably meet our future ministry needs. If for any unforeseen reason we are unable to proceed with the planned works, or there are surplus funds left over, we will use the donations to help with our day to day running expenses of the church. Many thanks for your support! We are also raising money via http://www.easyfundraising.org.uk/causes/stmarysconservation. Thankyou. Some Service Books will now be available in cream. Due to an increased awareness of people living with additional needs, St Mary’s are introducing cream service books. Cream paper can be easier to read from than standard white for those living with dyslexia or visual impairment. Please don’t hesitate to ask one of the welcome team when you arrive at church. Please do also let the church office know if we can support you in other ways if you have different types of additional needs. The foodbank is generously supported by food collections from the churches, for which we are extremely grateful. However there are always food items we run short of and at present we have completely run out of sugar, instant mash, tinned potatoes and long life fruit juice, long life milk, tinned corned beef, tuna, also pasta and pasta sauces. All donations of these items over the next few weeks would be particularly appreciated! Donations can be brought to our Donation Centre at Blatchford Road, between 9.30am and 3.30pm, Tuesday to Saturday and also left in the box at the back of our church. Last year Horsham District Foodbank fed over 1400 people, of which nearly 500 were children. Without the kind and thoughtful help of many, including Tesco, it would not be possible to provide this vital service. St Mary’s supports this HCT project and last year we provided 18k of food which is equivalent to 44 meals for those in need. If you would like to help, there is a box at the back of church for donations of tinned goods, pasta, cartons of milk and fruit juice etc – anything non- perishable and within “best before” dates. About Pilgrim Courses: These short courses of 6 weeks, are for all those who want to learn more about the Christian faith – eg: those who have recently started coming to Church; those who want the chance to think about Christian faith; those preparing for baptism or confirmation; those who have been Christians for many years and want to visit the roots of their faith again. 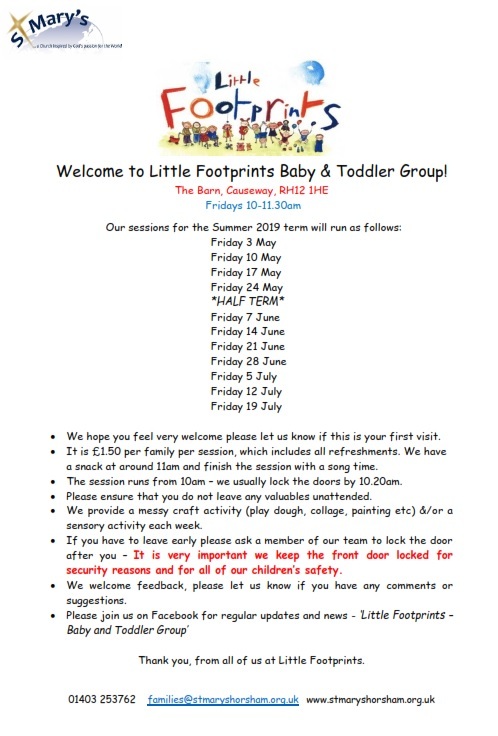 There is a group that is meeting on Monday evenings and some groups also meet on Wednesday and Thursday mornings. If you’d be interested in coming along to one of these please speak to Jimmy Young, Fiona Prentice or the Church Office for more details. Other home groups also meet throughout the week to share in bible study/ prayer/ fellowship etc, and details of these can be found on the notice boards in church. FairTrade: St Marys is a Fair-trade Church. Part of this involves us committing to using Fairtrade tea and coffee after services and in all meetings for which we have responsibility. So if you’re responsible for purchasing tea/coffee/biscuits/fruit/sugar etc for a church-related group or event, the Serving and Transforming MAP (Mission Action Plan) Team would like to remind you to buy Fair Trade products wherever possible! Church Welcomers: appeal for volunteers – please contact Terry Brinkworth on H. 249334 if you can help – if you can’t commit to a regular spot, would you be prepared to go on a standby list for occasional cover? TGIF – “Thank God it’s Friday” continues: This is our popular St. Mary’s Youth Club for young people in year 7 & over. TGIF meets for crazy games, sports competitions, Wii tournaments and arts & crafts. Where and When? 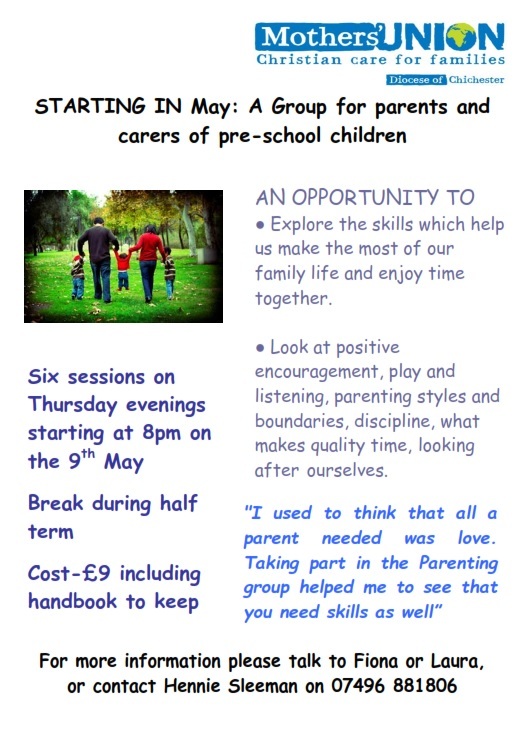 7.30 to 9.00pm in the Church Centre, every Friday evening in term-time, 50p entry. FIRST WEEK FREE! More Info? Contact Matt Lee (Youth Worker) on 07597 702394 or youthwork@stmaryshorsham.org.uk. Church Warden’s Request: Car Parking near Church… Please could drivers consider leaving spaces nearer our building available for our less able bodied members of our congregation who come to our church services? There is plenty of parking available at the Barn and further up on the Causeway for the Sunday Services. Could everyone also take care not to block entrances/driveways both on the Causeway and Normandy (especially for the Alms Houses and the School as access is needed at all times). Home Groups: there is a noticeboard at the back of church (facing inwards towards the pews) – it’s got photos of the groups and details of when and where the groups meet. Please have a look and see whether joining a homegroup would be something you are interested in. Sidespeople for 9.30am Services are needed A group of 5-6 people are needed each Sunday morning and at the moment each team does 1 in 4 weeks. You are needed to be at church just after 9am. Duties include greeting folk and handing out service sheets, collecting the offering, guiding people up to communion, tidying up after the service. Please ask any sidesperson for more information and contact Lawrence Windwood on 01403 268325 if you would like to join a team. Bellringing: Have you thought about asking the bell ringers to ring a sponsored quarter peal to mark your own special occasion? All monies raised will go to restoring this beautiful church building. Minimum sponsorship payment requested is £25 – but anything more than that would be gratefully received. Please contact Val Burgess on H. 268077 for more information. St Mary’s Souvenir Tea Towels – are on sale at the back of church – please support us by buying one! USB Memory Sticks – If you have any of the St Mary’s orange coloured USB Memory Sticks used for the Sunday services, please return them to the Church Office. Thank you, Steve Benson. Have you any spare fruit in your freezer or your garden that you might donate for us to make some more preserves? Please contact Sheila Pilkington on 268644 or Margaret on 250742. Jam Jars can also be left at the back of church (in the cupboard in the bell tower) or at the Church Office. The Sudan Church Association, have a box in the cupboard at the back of church, into which people may place stamps and postcards which the Association can sell to raise funds, they can also take coins ( pre-decimal UK ) and cigarette cards. Contact Richard Symonds via the church office for more information….so as the holiday season continues please do donate any postcards you receive! As many of you know Guy and Jebs returned from Canada after a three month sabbatical in the Autumn of 2016. You can see what they did on their exciting journey by reading their blog here. It’s easy to subscribe to the blog in order to be notified of new posts. We welcome them home after their fulfilling trip – “may the Lord inspire all of us afresh to seek after the Beauty of his Holiness”.